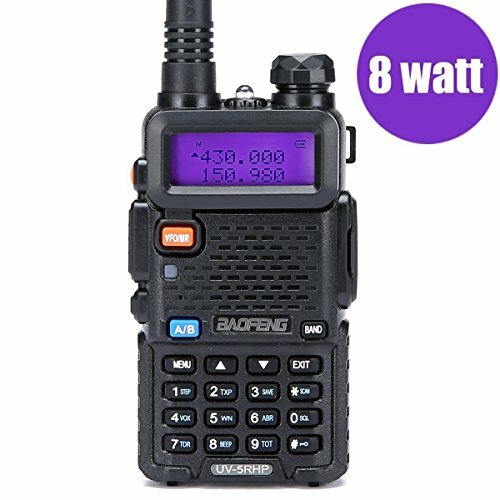 LUITON BaoFeng UV-5RH high power is a compact hand held transceiver providing 8 watts in the frequency range of 136-174 MHz and 400-480 MHz. It is a compact, economical HT that includes a special VHF receive band from 65 - 108 MHz which includes the regular FM broadcast band. Dual watch and dual reception is supported. You get up to 128 memories. Other features include: selectable wide/narrow, battery save function, VOX, DCS/CTCSS encode, key lock and built in flashlight. Selectable frequency steps include: 2.5, 5, 6.25, 10, 12.5 and 25 kHz. RF power may be selected at 8, 4 or 1 watts. This radio comes with an SMA-Female antenna, flexible antenna, BL-5 Li-ion battery (7.4V 1800 mAh), belt clip, wrist strap, AC adapter (8.4V 600ma) and drop-in charging tray. This radio requires the PC03 FTDI programming cable. FREQUENCY: 65-108 MHz (Only commercial FM radio reception) VHF: 136-174 MHz(Rx/Tx). UHF: 400-520 MHz(Rx/Tx). CHANNEL : Customize Channel Names, the Boot Display and More by Using the PC03 FTDI Programming Cable. BATTERY : 1800mAh Battery; Broadband (Wide) 25khz / Narrowband (Narrow) 12.5khz Selectable. FUNCTION : Auto Keypad Lock, Dual Band, Dual Display and Dual Standby. Manufacturer: Fujian Baofeng Electronic Co., Ltd. Publisher: Fujian Baofeng Electronic Co., Ltd. Studio: Fujian Baofeng Electronic Co., Ltd. If you have any questions about this product by LUITON, contact us by completing and submitting the form below. If you are looking for a specif part number, please include it with your message.